Rangers boss Ally McCoist insists he does not fear the sack despite his side's 1-0 Ramsdens Cup final extra-time defeat by Raith Rovers. John Baird's winner four minutes from the end stunned the Glasgow giants and ended any hopes of a treble. The League One champions must now pick themselves up ahead of Saturday's Scottish Cup semi-final with Dundee United. "I don't fear for my future at all," said McCoist. Rangers had chances to win the game, with Bilel Mohsni missing with headers from close-range either side of half-time, while Nicky Law hit a post in extra time. However, Law's chance apart, the Ibrox side did not look threatening in the extra 30 minutes. 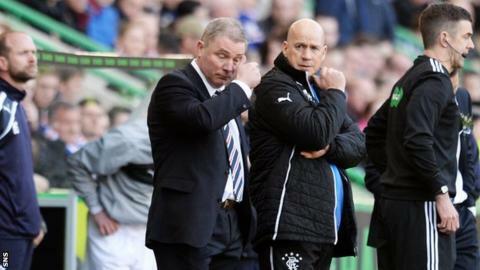 "I know the fans won't be happy, but no-one will have to tell me anything, that's for sure," said the Rangers manager. "That's up there with all the major disappointments that I've had, but it's not just about me - it's about the team and the club and the players, all of us together. "We don't have time to feel sorry for ourselves. That's the one thing we can't do. We've got a big game to look forward to on Saturday. "I thought we had the better chances. But, if you don't take them, you put yourself at risk and that's how it worked out. "I've been here long enough to know that there will be a lot of unhappy people after this result. But none more so than the players and myself. "We will need to play better than that because Dundee United are one of the form teams in the country."